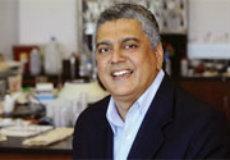 "This opens up a new field of research into new applications for inexpensive, readily available organic semiconducting polymers within solar fuel cells," said principal researcher Krishnan Rajeshwar, UTA distinguished professor of chemistry and biochemistry and co-Director of UTA's Center for Renewable Energy, Science & Technology. "These organic semiconducting polymers also demonstrate several technical advantages, including that they do not need a co-catalyst to sustain the conversion to alcohol products and the conversion can take place at lower temperatures and use less energy, which would further reduce costs," Rajeshwar added. Rajeshwar and his co-author Csaba Janaky, professor in the Department of Physical Chemistry and Materials Science at the University of Szeged, recently published their findings in The Royal Society of Chemistry journal ChemComm as "Polyaniline films photoelectrochemically reduce CO2 to alcohols." "Apart from these technical qualities, as a polymer, polyaniline can also be easily made into fabrics and films that adapt to roofs or curved surfaces to create the large surface areas needed for photoelectrochemical reduction, eliminating the need for expensive and dangerous solar concentrators," Rajeshwar added. Frederick MacDonnell, chair of UTA's Department of Chemistry and Biochemistry, underlined the importance of this research in the context of UTA's focus on global environmental impact within the Strategic Plan 2020: Bold Solutions|Global Impact. "Dr. Rajeshwar's ongoing leadership in research around new materials for solar fuel generation is vital in a world where we all recognize the need to reduce the impact of carbon dioxide emissions," MacDonnell said. "Finding an inexpensive, readily-available photocathode material could open up new options to create cheaper, more energy-effective solar fuel cells." Rajeshwar joined the College of Science in 1983 and is a charter member of the UTA Academy of Distinguished Scholars. He is the newly appointed president of the Electrochemical Society, an organization representing the nation's premier researchers dedicated to advancing solid state, electrochemical science and technology. About The University of Texas at Arlington The University of Texas at Arlington is a Carnegie Research-1 "highest research activity" institution of about 55,000 students in campus-based and online degree programs and is the second-largest institution in The University of Texas System. U.S. News & World Report ranks UTA fifth in the nation for undergraduate diversity. The University is a Hispanic-Serving Institution and is ranked as the top four-year college in Texas for veterans on Military Times' 2016 Best for Vets list. Visit http://www.uta.edu to learn more, and find UTA rankings and recognition at http://www.uta.edu/uta/about/rankings.php. For more on the Strategic Plan, see Strategic Plan 2020: Bold Solutions | Global Impact.